a blog by Sameer. Its all about programming and technology. Articles on C programs, C#.Net, VB.Net, ASP.Net, Sql Sever, Technology and many more. In this post i am posting a simple c# console program to start with ADO.NET. This may help the beginners in understanding the insertion of data into a database from a c# program. 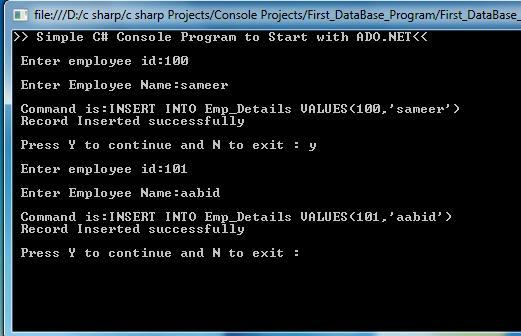 Now i am writing a c# program to insert data into the table EMP_DETAILS.. Execute the program to insert the records in the table EMP_DETAILS. The sample output is given below. Now open the sql server and type the following command and execute ..
Then u can see the inserted records in the table EMP_DETAILS as shown below. hay very nice ra wel don programmer......................! plz update me new issues in dot net...................! www.programmingposts.com. A blog by Sameer. copyright © 2017. Simple theme. Powered by Blogger.